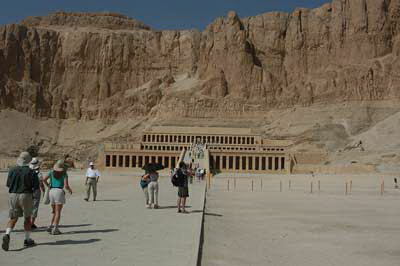 Temple of Hatshepsut 1480 BC. No "inside". Just an external building. This was the site of the 1997 massacre. Hadji="I've been to Mecca" It's a title. In a small village like this, going to Mecca is a huge honor. When he returns home, his parents paint on the house his means of transport. They have no running water here; water from Artesian wells. Death toll from 1997 massacre was 59: Swiss, Japanese, English & French. "Daughter of Amun Ra' = Hatshepsut; woman on the throne. She was resented so she took man's title & wore male clothes & a male beard. Very few pictures of her depicted as a woman. She exiled her stepson but later called him back to share her throne if he would marry her & be co-regent. 10 years after married her, she was killed by stepson. Chiseled all evidence of her by his order. 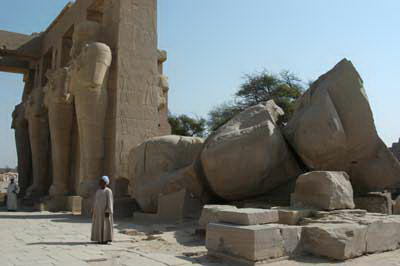 Thutmosis 1st's daughter was Hatshepsut & only child left; no son. 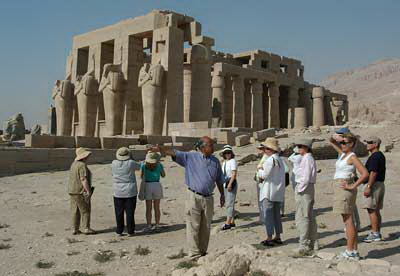 Thutmosis 2nd married Hatshepsut but he died. Then she came up with the story of being Amun Ra's daughter so crown not go to her son, Thutmosis III. Her guardian built temple for her & was probably her lover; unique build; terraces, no inside. Looks new because re-built (fixed) by U. of Warsaw but done badly. Modern day funeral; no work for 40 days; goes back to the 40 days it takes to create a mummy. (Saw women in black sitting by the side of the road.) Other people in the village run the home of the people in mourning so they don't have to do any chores. Aki lectured us here on the slaughter of 59 tourists that happened here a couple of years ago. Ever see a bunch of nervous tourists standing out in the open? 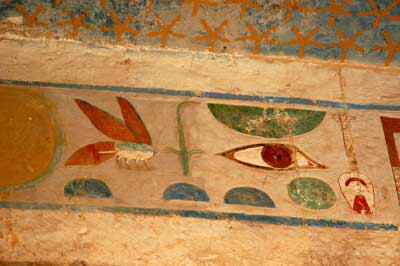 Brilliant colors on the walls in the temple.